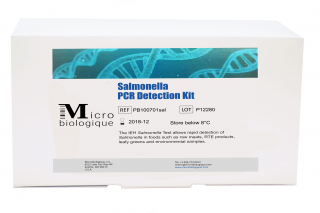 The IEH Salmonella Test System is designed for use by laboratory technicians with proper aseptic techniques needed to perform DNA amplification-based assays in a biosafety level 2 laboratory environment. The IEH Test System (AOAC PTM 100701) provides a procedure for the preparation of test samples, and a protocol for the rapid detection of Salmonella spp. in foods such as raw beef trim, raw ground beef, raw poultry, ready-to-eat (RTE) products (excluding STEC), and mixed leafy greens.